Description : The Johannes Oentoro Library in collaboration with the Information and Library Science Department UNPAD has conducted Information Literacy Instructor Training Course Package A at UPH Karawaci from the 4th - 6th December 2012. The Library team presented some sessions of this seminar. Description : Publisher’s Exhibit allowed publisher such as Cengage, John Wiley, McGraw Hill, and Pearson to introduce recommended books to support the curriculum of respective faculty in UPH. The exhibition was held at the 2nd floor of the Johannes Oentoro Library. Description : The 2012 LIBANEV with "Library & Environment" theme emphasized on active role in promoting issue about natural preservation to its users and society, especially in UPH other than collecting information related to environment. This event is once again held to help the UNESCO to promote the World Book day. Library users and staff alike were rewarded with souvenirs and prizes for every games, quizzes and lucky draw that they managed to accomplished. A storytelling competition and a website promo board design competition with "Go Green" theme were the two competitions held by the Library. "To Be A Successful Storyteller" workshop was held on Wednesday, April 11. This one day workshop purpose is to develop every participant to be a story teller in every field of education and profession. The main speaker of this workshop was Mochamad Aryo Faridh Zidni or usually known as Kak Aryo. This event was held at Desa Teluk Naga on Saturday, April 14. The purpose is to share humanity solidarity to the nearby society at UPH and to encourage the society on that area about reading interest and habit. · Friday, January 13, 2012. · At Computer lab., Building B.309, UPH Karawaci. 2. Launching the new version of library website & UPH Institutional Repository. This training is free for UPH lecturers and certificate is provided. Please contact eagle.dorothea@uph.edu (ext. 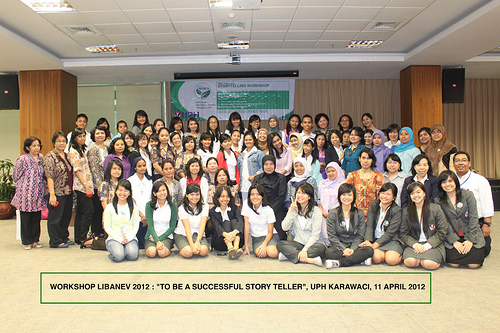 2511) or library@uph.edu (ext. 1370) for joining the training. As a collaboration program between the Johannes Oentoro Library and FDU and attending by 47 participants, the workshop was opened by Ibu Rini Wahyuningsih (FDU Director). Then it was followed by launching of new design of library website and UPH Institutional Repository. Ibu Esterina (Library Manager) gave an appreciation of the hard work done by ASD Team in the project collaboration project with the Library for the new design is more interactive, informative and provides real-time data. In the next two and a half hours, Bp. Dhama led the workshop of using online resources, i.e. E-journal databases (EBSCO, JSTOR, SpringerLink), E-book database (Ebrary) and E-theses & E-dissertation (NDLTD). Each database has its own strength either the contents or searching tool. 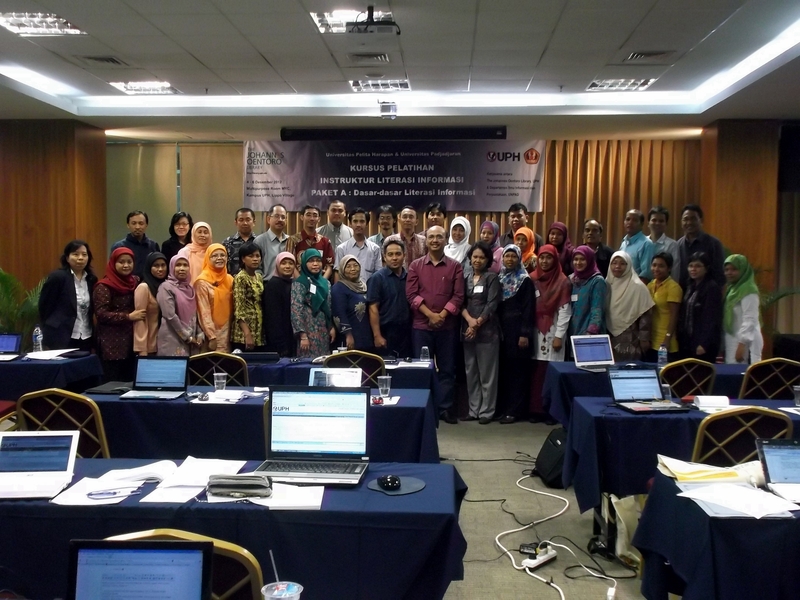 During the workshop, many participants showed their enthusiasms by giving recommendations and suggestions for these resources and UPH Institutional Repository. We hope many more lecturers are aware with the benefits of online resources and get accustomed to using them for supporting their research work.